"A fascinating and thought-provoking book about 1945 as seen through the eyes of a Jewish girl who won a beauty title. It's about the boys coming home crippled from the war...It's about Jewish Americans finding out about the horror of the Holocaust and how that made their Miss America a symbol of hope." "Bess Myerson died in December, 2014. She was a beauty queen, a TV star, a politician, a resourceful public servant, a disgraced public servant. I spent a long time writing a book about her astonishing rise. It was a real eye-opener for me, to peek inside the lives of women whose sense of self depended so completely on other people's perception of their beauty." Susan was among the friends, colleagues and journalists featured in the Sunday Styles profile of Bess Myerson in The New York Times, "Remembering Bess Myerson's Turbulent Public Life". 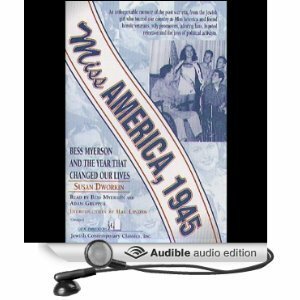 The audiobook -- narrated by Bess Myerson herself and audio star, Adam Grupper -- is available on Audible.